I so want to love Louise Penny’s mysteries! She is one of the biggest names in Canadian crime fiction, which means (among other things) she has long been in my sights as a contender for my mystery class. And she has a lot of fervent admirers, including many of my friends. Also, of course, it’s always a pleasure to find books of any kind that I really enjoy, and even better to find a whole series. But after a few tries, I just don’t think it is going to work out that way for me with Penny. I read Still Life first and thought it was just OK. Since then, I’ve started several others, picking them up almost dutifully on trips to the library, but I’ve always abandoned them after a couple of chapters. 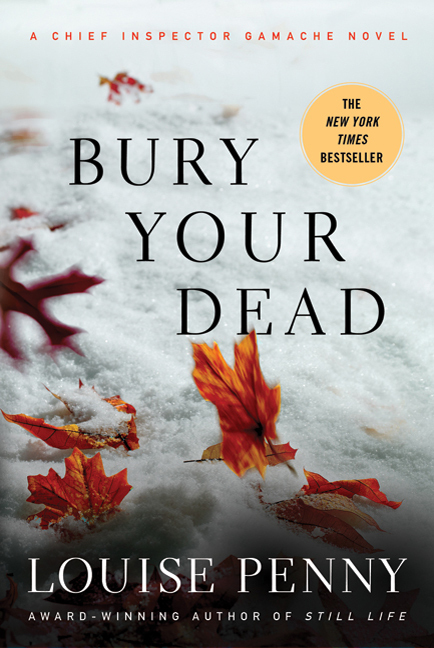 I did better with Bury Your Dead: I persisted to the end (though by half way through I wasn’t reading very carefully) because there was actually quite a lot I liked about it. For one thing, my personal taste doesn’t really run to the “village mystery” or cozy, and that’s more or less what Still Life and the other ‘Three Pines’ ones I’ve tried feel like (though formally they are hybridized with the police procedural). Bury Your Dead, however, takes us (mostly) out of Three Pines to Quebec City. There it tackles pretty ambitious historical and political themes with its focus on the beleaguered-feeling Anglophone community, Quebec separatism, and the symbolic significance of the “Father of New France,” Samuel de Champlain. Penny’s use of this broader context to motivate her specific murder mystery reminded me of Ian Rankin’s books dealing with Scottish nationalism. I also liked Chief Inspector Gamache a lot: if I try another of Penny’s books, it will because he’s the kind of protagonist I enjoy following. Mind you, he’s also a pretty predictable type — not, in this case, like Rankin’s anti-heroic Rebus, but a close cousin to, say, P. D. James’s Adam Dalgleish. That’s OK: I like my detectives tall, dark, and brooding. Since my experience with the series is so limited, I don’t have a strong sense of Gamache’s relationships with the rest of his team, but what I saw seemed well-developed. I was also impressed with Penny’s obvious competence at plotting, and at the way she unified the three central stories of the book around the theme of mistakes — making them, dealing with their consequences, moving past them. And now here he was, beneath the Literary and Historical Society, that bastion of Anglo Quebec. With a shovel. Once or twice in a novel, in moments of extreme emotion, this kind of thing is OK. But Penny relies on this trick a lot, as if she doesn’t trust her readers to feel appropriately worked up without a signal. It got pretty tedious and detracted, I thought, from some of the novel’s most potentially moving or gripping moments. I wonder if her editors have ever resisted this habit — or maybe they like it. I also got fed up with the manipulative way Penny strung out the novel’s backstory about a botched response to what turns out to be a terrorist plot. The aftershocks are significant and compelling, but because everyone in the novel already knows about it, keeping it from us felt really artificial — a trick, to play on our nerves, rather than a structural or thematic necessity. It’s true that I kept reading because I wanted to know what had happened, but I felt impatient rather than invested, which is not a good thing. It’s also not something I can ever remember having felt reading a Rebus novel, even though they have gotten longer and denser over the years. I’ve read 2 or 3 of Penny’s novels and wondered if I would like them better if I read them in order. I like Gamache, but for me he’s not must-read interesting. I enjoyed the Canadian setting. But I can’t wait to get my hands on Paretsky’s latest! I adore V.I. This is definitely a book that makes its Canadian setting a real part of what the book is about, which I appreciated. I’ve only been to Quebec City once, too, and as it was to take my son to a chess tournament, I didn’t get any time for sightseeing. So it did have a bit of that touristy exoticism for me too. It’s really true what you say–there’s only so much time and attention to go around, only so many series we can dedicate ourselves to. Do you find that when you become attached to a series you stick with it indefinitely or do you lose interest in some? I do tend to be pretty loyal and at least keep trying with a series I have liked in the past. Sue Grafton’s Kinsey Millhone novels are a good example: though I really haven’t liked the more recent ones, I do usually still pick them up and have a go. I wouldn’t claim this as a virtue or anything: I think it’s just that a series I know at least has the virtue of being familiar. And there’s the character arc: when you’ve ‘known’ a detective for decades, it’s nice to see where they are going, even if the case or the novel otherwise disappoints. Tana French is an interesting variation on the series theme because she doesn’t give us that continuity of characters so her books are bound by their kinship to each other and by her style or approach more than by building one ongoing relationship with the protagonist. So far (though with some reservations) I like her writing well enough to feel loyal to her. My pet peeve was the badly researched (or misleading or both) legal information. Like the bit about how, in Canada, some trials were just too gruesome to be made public so they were held in secret with Gamache as an honoured guest. What? You mean the much publicized Picton trial was held in secret/private etc.? Even worse, Americans read this BS and think “oh I didn’t know Canadians did that.” We DON’T. Or how one character who bashes an old Hermit to death with a menora only gets charged with manslaughter (not murder) because…..well because why exactly? Gamache opines: “Because Olivier is a killer but not a murderer.”….No, monsieur, that would end up as a second degree murder conviction not a “but I didn’t really mean to kill him” manslaughter charge.